I finally took the time to sit down and crochet a few hearts. After all, tis the season! I love how I'm so busy counting or talking in my head while I crochet to keep track of where I am that the stress of whatever else was going on diminishes. These are just a few little fun mixed media pieces I created using my crocheted hearts. The above hearts are made with perle cotton embroidery thread while these below are a bamboo blend of yarn. The color is called "Ocean Spray"
Doesn't the name alone just take you away? Lucy likes the soft bamboo yarn too. This is another small piece, like a tag size, where I just cut out felt flowers and created a design with embroidery stitches. Now that I've fed my creative spirit I feel so much better! Wishing you all a lovely week ahead, and don't forget to take a break from life and do what you love to do! Gorgeous...I love your needlework and crocheting....wonderful work. I actually had time to do what I love to do today...made some cards for a change...happy Sunday to you. These are so awesome. I love the leaves, the needlework...all of it! Becca, those are all so pretty! I'm inspired! I picked up a crochet hook and yarn this week and started practicing! Its been over 30 years! Very cute! You are really creative. I am so happy we connected on FB! Yay! Maybe some day I will visit Seattle on vacation and get to actually meet you. I think this year summer vaca is Portland! Yay! Art. Trees. Ocean. Hope your packing is going well. Give Lucy a hug. Becca I love love your creations!!!! Lucy is adorable!! I miss having a kitty!! All your stitching looks so preety I love you felt flowers. I love your hearts.Your colors are so vivid. I just posted the ones I made from different threads, each looks so different. I needed a change of pace. Always love what you share with us. Was a good weekend to be inside, with howling winds and 8 inches of snow and below zero temps. Forecast Ice. these are so lovely, perfect for valentine's day! Love your pattern for the hearts!! Is this your own creation? If so, would you share!? If not, where did you find it? LOVE your blog and music! Like to come over here and tootle around! Those are such sweet little hearts Becca! I can't believe all that intricate work that you do with your crafting. My eyes get tired just thinking about it!! Haha! Beautiful! Wishing you a wonderful week as well friend! Wonderful stitchery - a delight for the eyes! I love these little hearts and the mixed media way that you use them. The felt and embroidery piece is lovely too. I really need to practice my embroidery skills soon. Thanks for sharing. How beautiful, Becca! I always love to see what you are creating and crafting! 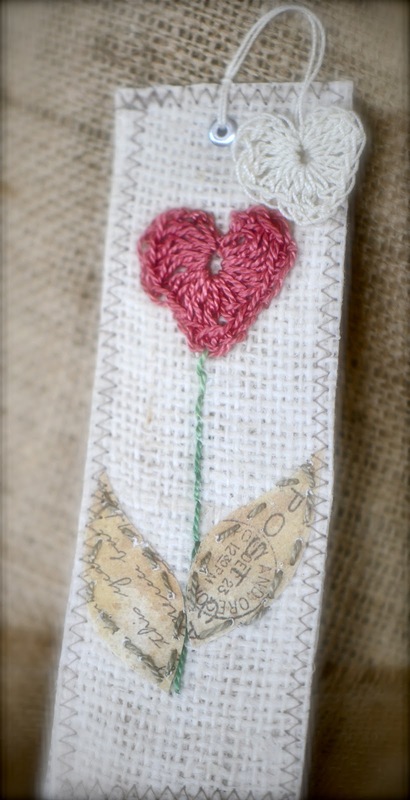 I love how you mixed these hearts with the mixed media--perfect!! Becca ..how i love the simplicity yet detailed feel to your creations ...your photos of them are perfect!! These mixed media pieces are so beautiful! 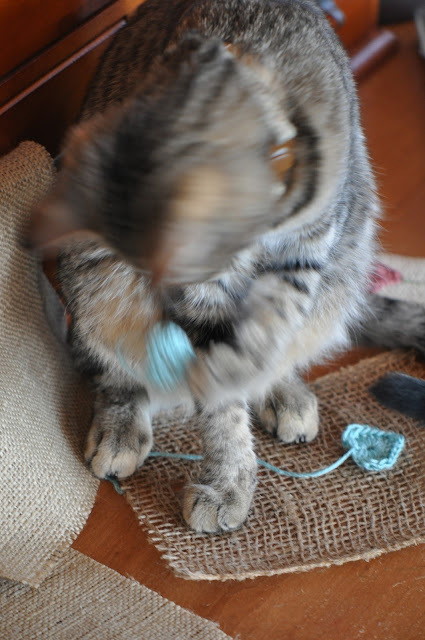 Lucy enjoyed your crafting too! Love these mixed media pieces, and I agree wholeheartedly that it is really important to feed your creative side regularly. The little yellow flowers with the embroidery is SO cute. You amaze me. I love the yellow flowers. I might try that. I would love to do the hearts as well, did you have a pattern to do them. They are so pretty. all such pretty pieces. hello to kitty!! hoping you are well, my friend. i have a quick question-sending you an email. Gorgeous pieces you have here. It's amazing all the creative work you can do. wow!! Becca! It's been a while, I hope you're well. I love your projects (and oh my goodness it is WAY too long since I've had the chance to be in my studio!!). I especially love the felted flower and your embroidery - the colors are just gorgeous. On another note I totally envy you getting to meet some of your blogger friends (I'd love to meet Catherine). Looking forward to popping by more ferquently, my start to the new year wasn't so very good so I've got some catching up to do. Hearts and flowers are perfect for the season! I especially like the felt flowers and your pretty stitching. That looks like very good felt...thicker than most, or maybe it's just your photography. So sorry to hear about your auntie. Passages are difficult...thinking of you! Hugs, too. So sorry to hear about your aunt. I remember you talking about how much you loved spending time with her there on the gilkey bridge property. Feeding our creative spirits does wonders for our souls.